Well to set the stage for this one; it’s a hot summer day and I’m sitting on the deck at Missy's house with my nephews while the ladies are having a "tea party" inside. Well the women can do their thing and the guys must do ours. But it couldn't be better conditions for a summer beer. 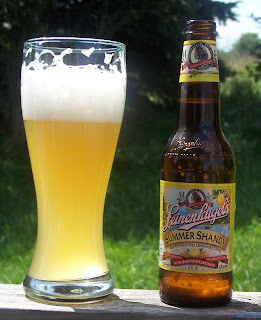 The Shandy pours a cloudy pale yellow color with a creamy but somewhat soapy white head. The head diminishes pretty quickly but keeps a nice thin protective layer over the top of the beer. A typical head and lacing that you would expect from a wheat beer but it just does not stick around as long. The nose is almost pure lemon, some of your typical wheat beer notes but mostly covered up by the citrus aroma. The first and last thing that you taste in this beer is lemon. This could be a real turn off for those looking for a typical beer flavor. The mouth feel is very creamy and smooth mainly due to the nice head on the beer. I find the tangy citrus flavor most refreshing. As the head diminishes the mouth feel changes to a more carbonated citrus tingle on the tongue. This is a highly carbonated beer which I think adds to its refreshing character. It’s a very crisp tasting beer. Not the beer crispness that you will find in a pilsner but a fresh clean taste of cold lemonade on a hot day. Don’t drink this if you are expecting a typical beer type of experience. This is not your typical beer. It is truly a blend of lemonade and wheat beer; as it says on the label a “Weiss Beer With Lemonade”. For that reason this beer is not for everyone. It is very different, I find it very refreshing on a hot summer day but others may find the lemonade blend too strange to swallow. I’m not really sure why I like this beer. I am usually more of a beer purist rating and comparing beers to its unique style. Maybe I’m doing this with the shandy. At any rate I think this is a very refreshing summer beverage. I don't think I'm going to give it a letter rating. I like to rate beers based on that style so since this is my first Shandy I really have noting to rate it against. I really like this beer (using that term loosely it may be more of a beverage than a beer) . I highly recommend this beverage but with the caveat that isn't probably not for everyone. Yeah but Ken did have another one the next day or was that just to show some down home hospitality. Oopps! Maybe me thinks it was to throw you off so that you would think that it wasn't good and then he could have the rest to himself. Never trust a harrison.